In 2008 Jason Segel was fresh off the success of Forgetting Sarah Marshall. As both the writer and star of the film he was being courted by numerous studios when he took a meeting with Disney. Upon offering him carte blanche to do whatever he wanted Disney execs were stunned when he immediately began pitching a new Muppet movie. Segel came of age as a performer working with Judd Apatow (Knocked Up, The 40 Year Old Virgin), so trusting him with a family friendly franchise might seem counterintuitive. But while Apatow isn’t afraid of a dirty joke what makes his films stand out is their unwavering sense of sentimentality. After hearing Segel’s pitch Disney took a major leap of faith and, for the first time in the history of their existence, The Muppets were under the control of an outsider. The end result is The Muppets which is easily the best Muppet movie since The Muppet Movie. Segel plays Gary, a small town boy in love with a small town girl (Amy Adams). He also has a brother named Walter (voiced by Peter Linz) who is not only The Muppets biggest fan but a Muppet himself. When the three of them arrive in Hollywood to discover that the legendary Muppet Theater is not only languishing in disrepair but also targeted for demolition by an evil oil baron (is there any other kind) they jump into action. They convince Kermit (voiced by Steve Whitmire) to round up the old gang and put on a show to save the theater. Sadly, they quickly realize that their glory days are behind them and they are no longer the pop-culture juggernaut they once were. 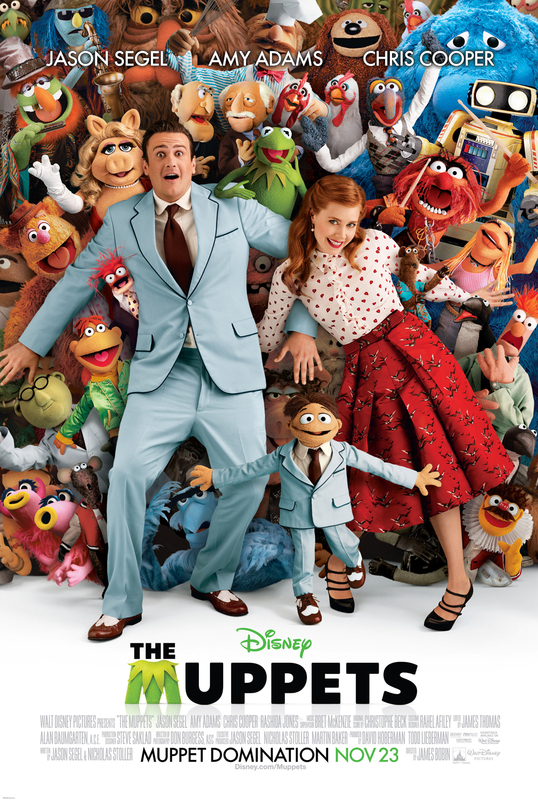 Society’s indifference to The Muppets is the overarching theme of the film and it’s a wonderfully endearing one. The Muppets always work best as underdogs and this conceit serves them nicely. The film ends up mirroring the framework of their first film as Kermit begins rounding up his ragtag gang of misfits. 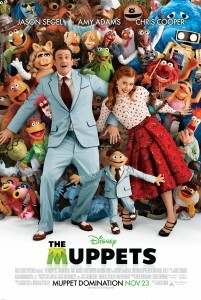 Segel and his writing partner Nicholas Stoller (Get Him to the Greek) positively nail the tone of The Muppets. The jokes are legitimately funny but they never break character for a cheap laugh (as some feared the might when Segel and Stoller were put in charge). It’s obvious that these two have great love, respect and admiration for these characters. They’ve clearly taken great care to afford them the respect they deserve. And just to up the degree of difficulty they decided to make the film a musical. The original songs are written by Flight of the Conchords Brett McKenzie and it’s the strongest franchise soundtrack since The Muppet Christmas Carol. Maybe even stronger. Quite frankly, there is nothing about this film that doesn’t work. The songs are good, the jokes are funny, the tone is perfect, and they resurrected the usage of peppering the film with celebrity cameos. You even get to see them do an episode of The Muppet Show. Or at least pretty close to one. It is simply everything a kid’s movie should be – fun, funny, heartwarming and smart. And it couldn’t happen to a nicer franchise. On a scale of 1 to 10, with 10 being The Muppet Movie and 1 being Curse of the Puppet Master, The Muppets gets a 9.